The easiest way to earn through your blog or business website. With Google ad sense, you can display targeted as adds on your website very easily. Here are the best WordPress theme that allow displaying advertisements on your website using the Google AdSense services. So you can earn money on per-click or per-impression basis! Therefore, your website will not only satisfy its purpose but also earn for you. With blogs or corporate websites, the best way to monetize is to display advertisements. If you too want to make some passive incomeheckout each theme and select the one that looks good to you! 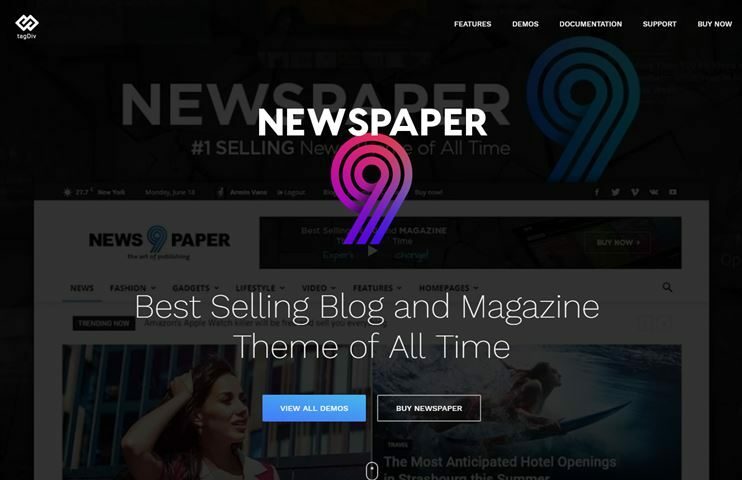 News Paper 7 is a popular and feature rich news and magazine website. This theme is designed for news or blog website with a great design, flexibility and ease of use. This theme is really feature packed and highly customizable. If you want to create a complex website with many features, you can go for this theme. It comes with number of utility based widgets. You can organize your pages with the drag and drop page builder - Visual Composer. It also allows displaying pictures using drag and drop gallery. You can easily embed videos from youtube or Vimeo. It is speed and SEO optimized. 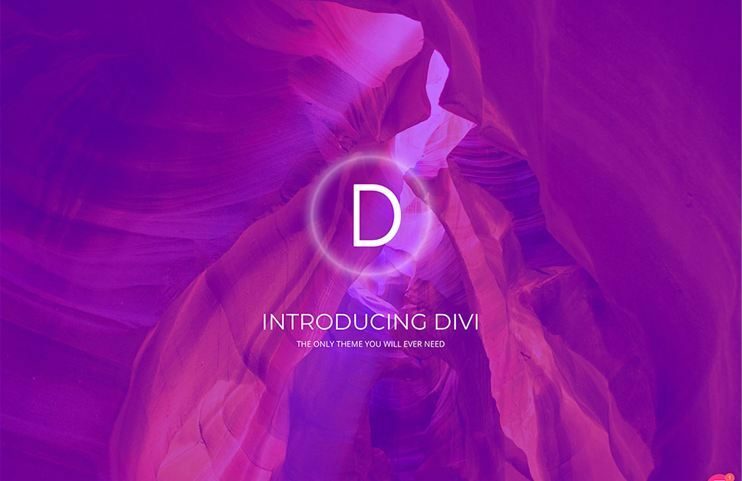 Divi is a multipurpose theme with enormous flexibility and features. You can use this theme to create a website of any subject. It provides you with all the easy options to create a website. There are demo options for divi, you can choose from. The theme appearance can be managed with the live customizer. You can create pages and content with the drag and drop divi builder. You can also choose from the pre designed page layouts. The admin panel options are properly organized and you can easily change the general theme settings or the design settings. Good Life is an easy to use, multi purpose theme. It lets you create a website of any subject. This theme comes with adjustable adspaces where you can show advertisements and earn revenue. There are amazing Demo designs you can choose from. This theme can be used for multiple purposes. The article/blog pages are well designed. To display image galleries and videos you have pre designed formats and pages. Good Life is highly customizable and has number of useful features. It is Speed and SEO optimized. 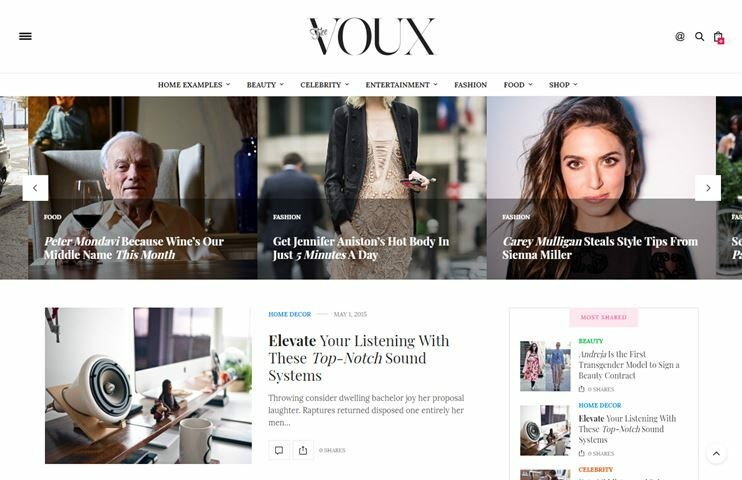 The Voux is a magazine WordPress theme. It has a modern design and is very lightweight. There are demo options to choose from. The theme comes with some pre designed pages, ready to use. However, you can add twists to this pages using the Visual Composer drag and drop page builder. The Voux is SEO friendly. With this theme you can create a website with a distinguished look using the options. You can also use the WooCommerce plugin for creating a shop in your magazine website. 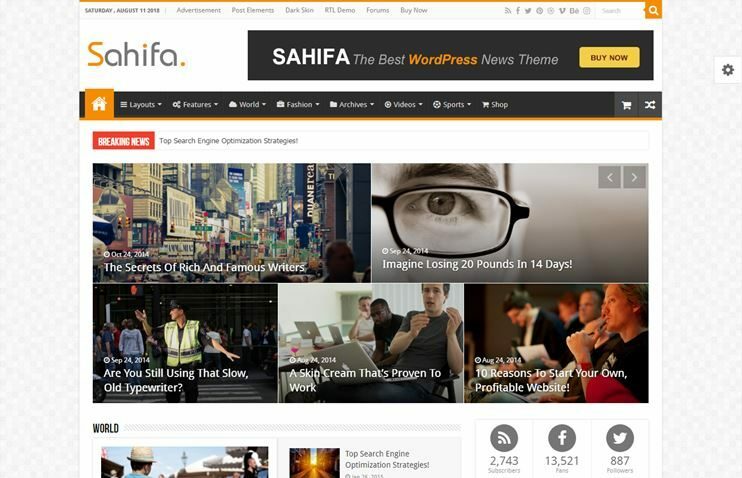 Sahifa is a news and magazine WordPress theme. It is one of the best themes for creating an RTL website in 2017. Sahifa comes with an inbuilt page builder to let you create pages with drag and drop options. The admin panel has powerful options to let you change the theme settings. It allows the integration of BuddyPress and bbPress. With the WooCommerce plugin, you can also convert your magazine into an ecommerce website. Sahifa is SEO and speed optimized. To organize your content you have plenty of custom widgets and shortcodes. 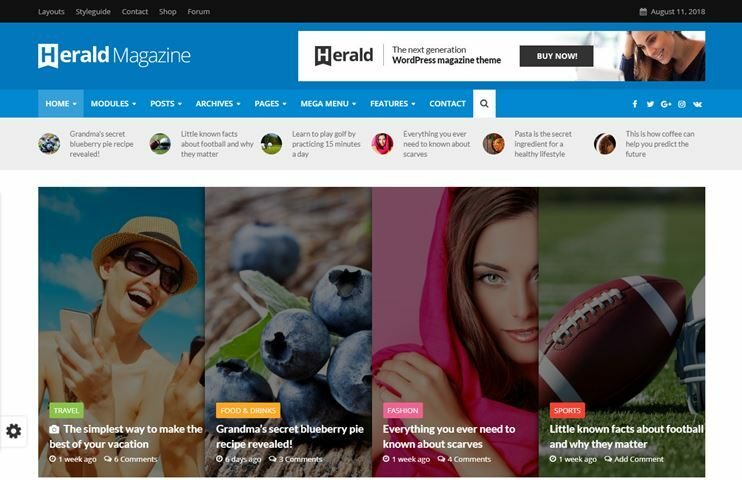 Herald is a news and magazine WordPress theme with latest design and features. The theme can even be used as a reviews theme, using the WP reviews plugin. Herald allows you to choose from the available demo options. You can use the WooCommerce plugin for ecommerce features in your website. 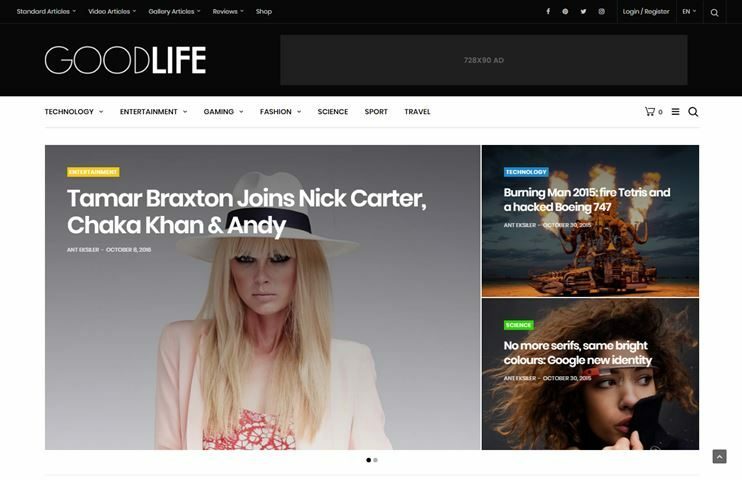 It is a speed optimized theme for creating a feature rich and attractive news website. There are many options for changing how the theme looks. So, you can mix and match the options and come up with your own unique design. It is social sharing ready. 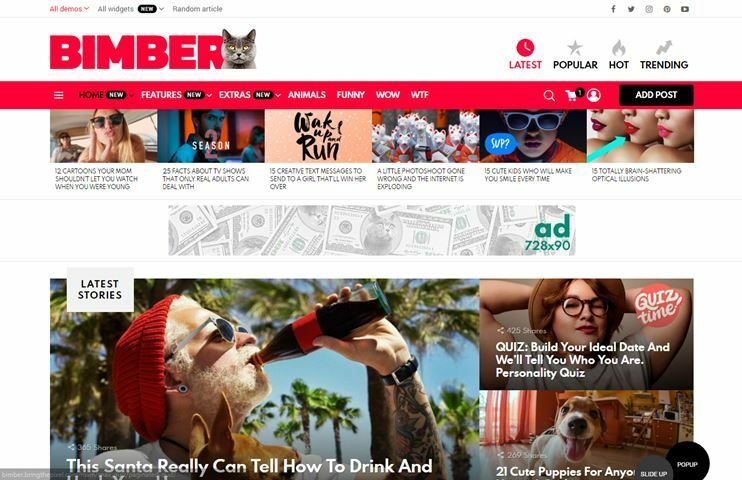 Bimber is a theme that lets you create a website for viral news for 2017. With inbuilt powerful sharing features, your articles can go viral instantly. You can also allow front end submission by using a plugin. You can create your articles with gifs, images, videos, etc. 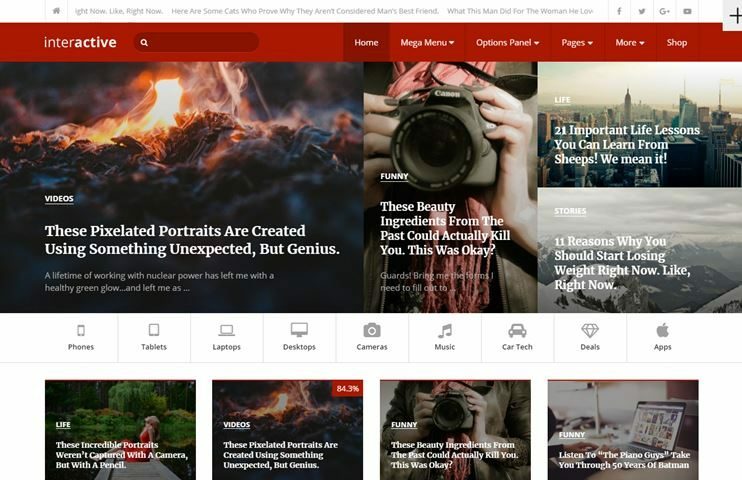 The theme lets you show your article under popular, hot and trending lists. The theme is very much optimized for advertisements. Because a viral website ensures high traffic and so the advertisements in such websites are worth it. It is SEO optimized. 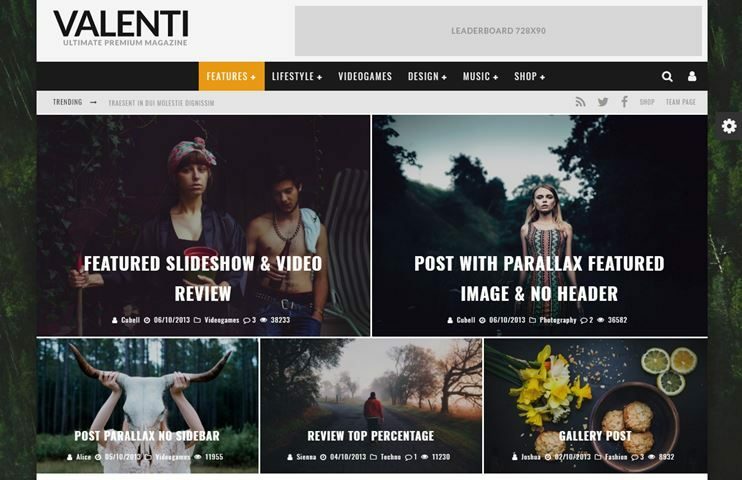 Valenti is a review or magazine Valenti ensures that you would need no coding skill to create your website. It is one of the adsense enabled WordPress themes. With this theme you can not only create beautiful posts but also allows you adspaces to display advertisements. Valenti comes with some pre designed page templates. The theme allows compatibility for bbPress and Buddypress. It offers complete ecommerce support with WooCommerce. The theme is SEO ready too. 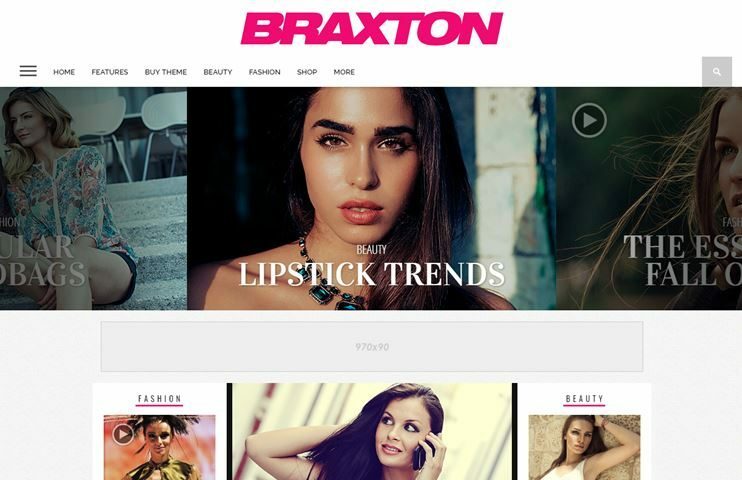 Braxton is one of the ad optimized WordPress themes for magazine. 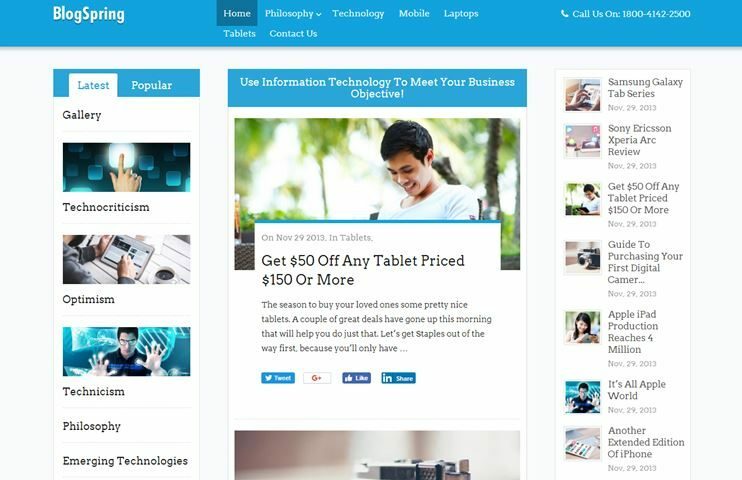 You can use this theme to create a website where you can post your articles along with advertisements. It is compatible with the WooCommerce plugin for ecommerce feature. The theme also allows bbPress forums. In this magazine you can add video or audio posts. The homepage design can be recreated using the drag and drop options. Braxton is SEO optimized. 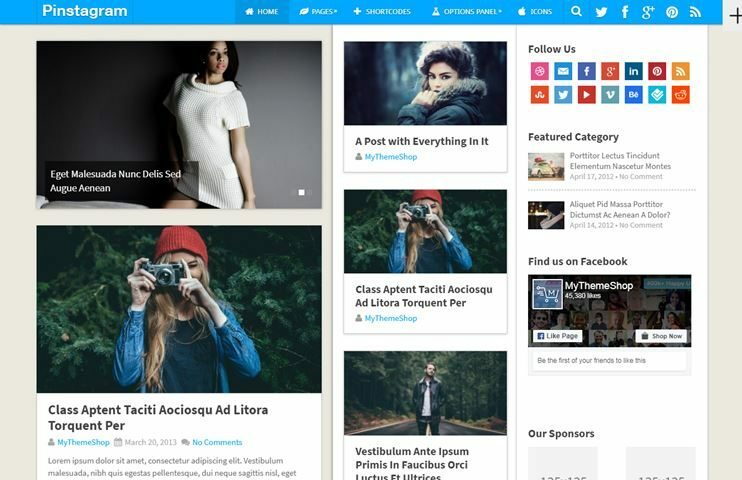 Flex Mag is a Google Adsense WordPress Theme. It is a news and magazine theme. There are many options for article views and featured posts. The homepage design of this theme can be restructured using the drag and drop homepage. It is SEO optimized. You can use WooCommerce for the eCommerce features and bbPress to create forums. The theme allows easy and abundant customization options. You can change the theme settings with the custom admin panel options. True Mag is a video magazine theme. It is one of the adsense compatible wordpress themes that allows you to create a video magazine website. It has inbuilt essentials like video view counter, ratings, etc. It supports video ads and Google adsense. Create unlimited pages with the drag and drop Visual Composer page builder. This theme allows you to choose from more than 10 demos. You can change these designs later with the plenty of the customization options available. The theme is designed to give a better user experience and a convenient interface. True Mag is compatible with WooCommerce, BuddyPress and bbPress. 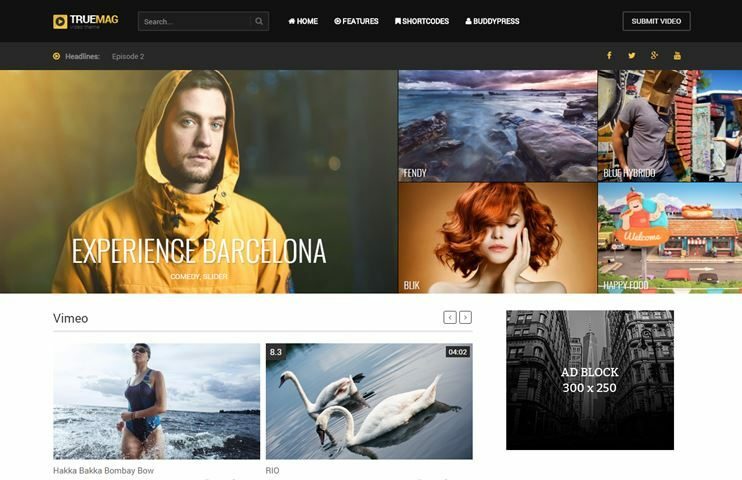 Max mag is a professional and feature rich google adsense WordPress theme. The theme allows you to create amazing magazine website with easy options and flexible features. You can recreate your homepage with the drag and drop homepage. The theme is SEO friendly. The theme is highly customizable. It comes with advanced admin panel options to change the theme appearance. It also allows integration of WooCommerce and bbPress. 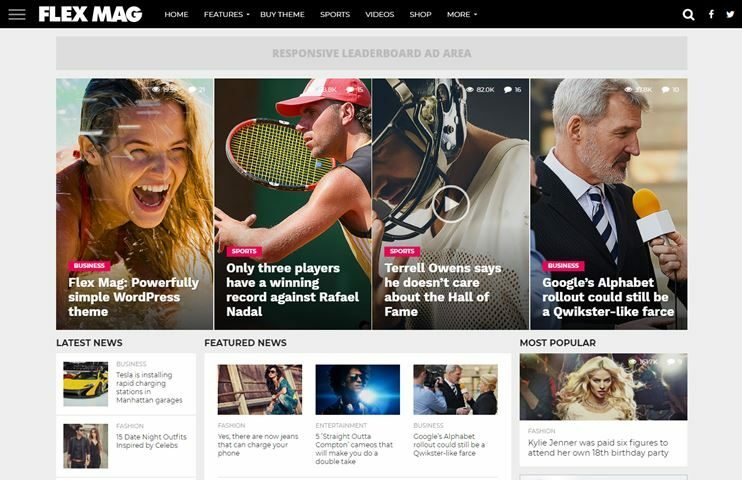 Grimag is one of the best adsense compatible WordPress themes. With this theme you can create a magazine website and monetize it with advertisements. This theme is easy to use. You have a few and easy options to customize your website and to change how it behaves. The ad spots are designed to gain attention and are placed at prominent places. It is SEO ready. It has a clean and valid code. 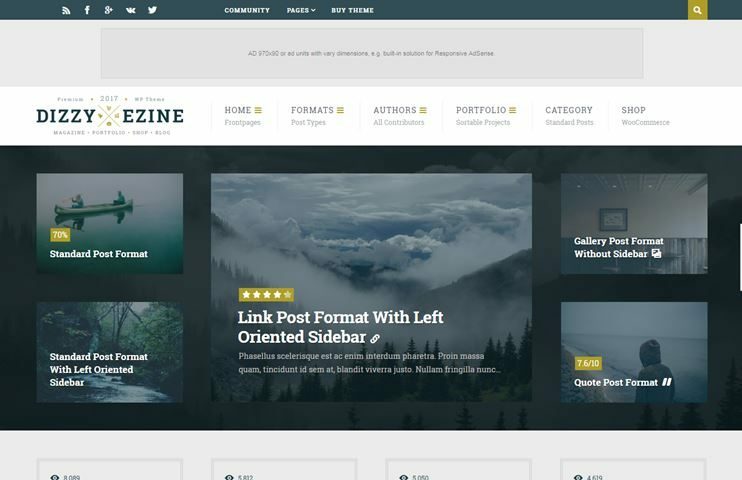 DizzyMag is a WordPress theme for reviews and magazine. It can also be used for shop or creating a corporate business website, online shop, etc. The theme is easy to use and highly customizable. You can choose from the two homepage templates. With BuddyPress you can also create online community on your website. You can also have forums using bbPress. This theme is WooCommerce compatible and allows to setup an online shop. You can even create amazing portfolios with video, images, etc. With the review and ratings feature, you can create a reviews website. It is SEO optimized. Interactive is a beautiful blog theme. It is extremely easy to use and even a non-technical user can create superb blog websites. There are customization option. It lets you create beautiful website with 3 column layout. There are multiple home page designs. The theme comes with powerful and intuitive options to change how the theme behaves. It is speed optimized and social media ready. It is a child theme ready. This theme is SEO optimized. 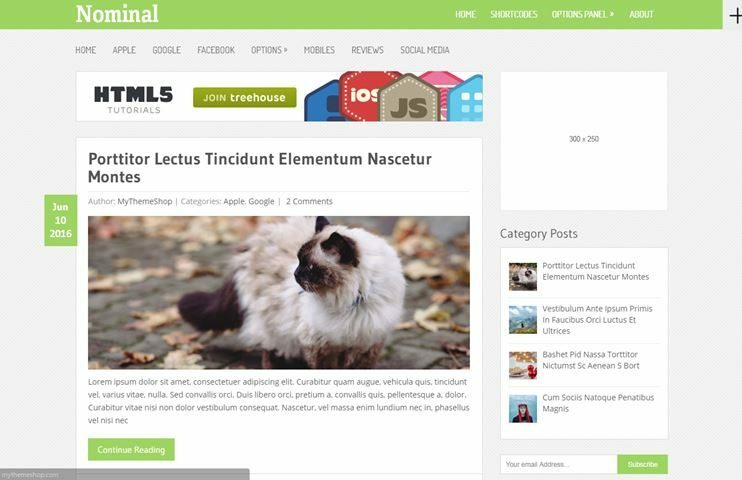 Nominal is a blog WordPress theme. It can be used to create a blog website of any subject. The design of this theme is clean and focuses on readability. It is SEO and speed optimized. With Social media integration, the post can be easily shared. The theme comes with intuitive options to manage the website. There are custom shortcodes and widgets to organize your content. Pinstagram is a theme inspired by pinterest. 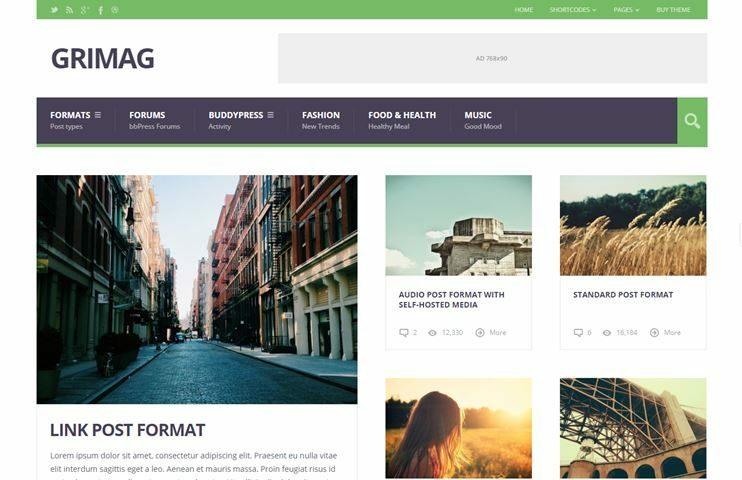 This theme is easy to use and has a great grid view to increase page views. It can be used to create any kind of website. Pinstagram is customizable and easy to use. You can choose the color of your website and fonts from the Google fonts. The theme is social share ready. The theme comes with movable ad spots. Pinstagram has a clean code and is SEO ready. BlogSpring is a theme for blogging and magazine. Along with this theme you can earn revenue with the AdSense advertisements on your website in 2018. The theme comes with all the features to create a complete news or magazine website. It has an integrate commenting system through which visitors will be allowed to comment through facebook or google. Besides there are plenty other features that you can use for creating you website. We hope this list of Google Adsense Optimized WordPress Themes 2018 helps you find the best theme for your website. We have tried to include the most prominent, flexible, feature rich yet simple, easy to use and convenient themes in this list. We'd love to hear from you. So, you can use the comments section below to post your opinions, questions or remarks. May I suggest: theme-stop.com/themes/viral-mag/ which is a free popular Adsense optimized magazine theme that I think would be of interest to your readers.